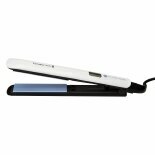 To create a salon-sleek look at home, choose from the professional straighteners here at Walgreens.com. Try an instant heat straightening iron to reduce the time spent styling your hair. Flat irons can come in titanium and ceramic materials to offer different types of heat distribution and protection for your hair. Choose the size of heating plates and the hair straightener brand you want, whether it's BaByliss or Revlon. Hair lotions, sprays and hair serums can help control curly or wavy hair, tame frizz or protect from humidity and heat damage. Some hair straightener creams can also protect against heat damage from hot irons and hair dryers. There are many alternatives if you are looking for hair straightening products. You can use a tool such as a flat iron, you can try chemical treatments such as hair relaxers, or you can attempt natural methods. Whether you're looking for permanent hair straightening or just want a hair straightening shampoo for more control and manageability, there are plenty of options for you to choose from here at Walgreens.com that can help you achieve the results you are after.